Since the first of January knocked on our door, I have been receiving a bountiful stream of e-mails about detoxing, healthy living and the way to help with New Year, New You resolutions. While I actually subscribed to those news alerts in the first place, I find that a few days in I am actually geting stressed and somewhat overwhelmed by those e-mails, that seem to pull me into different directions. Instead of too much information, I actually crave calm and focus! I don’t want a ‘new’ me – there was nothing wrong with the ‘old’ me in the first place, what I DO want is a better version of myself, the one that gets back on track of daily life after the festive indulgence, that I thoroughly enjoyed. Doing it quickly and taking on too much is a root to failure, so instead I am taking things slow and easing myself in gently into 2017. Below are a few suggestions that I hope will resonate with you and if they don’t, please feel free to comment and share what works for YOU, making return to work and hectic schedules easier ! Start the day five minutes early, allowing yourself to meditate, dream or just enjoy the cosiness of your bed, before getting up and getting on with your day. When we force ourselves off the bed too quickly, we start the day on the wrong footing. Have a cup of warm water or mix one tsp of organic apple cider vinegar or squeeze half a lemon into it first thing in the morning. I tend to make a glass the night before and leave it in the microwave, which I turn on first thing, when I come into the kitchen. 30 seconds later I have something that will kick-start my digestion and help my body get the best start. 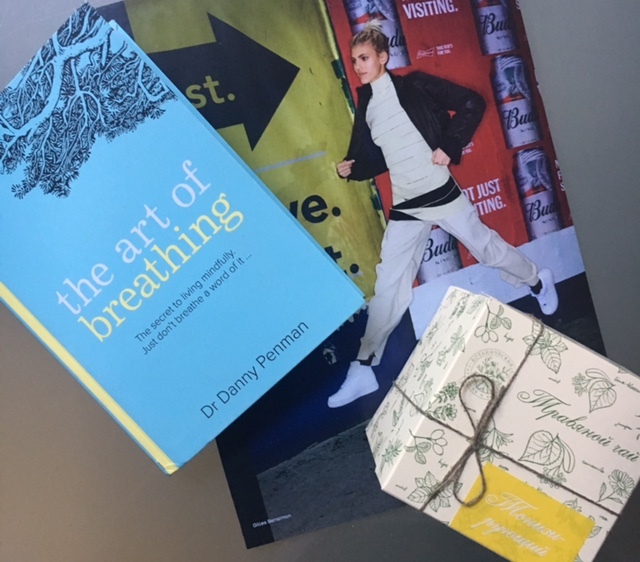 Get your hands on Dr Danny Penman’s book ‘The Art of Breathing’ and read it in bed, before you go to sleep at night. ‘The art of breathing lies in having the courage to let go. To let go and allow your breath to breathe itself. And when you do this, something miraculous begins to happen, life begins to live through you’. This small book will hopefully make you think about the way you breath and introduce some positive changes that will enhance who you are and what you do, while benefiting your health, wellbeing and the way you look. While I love my coffee, tea offers an opportunity to take the time out, savour the flavour, breath, think, reflect. It is a meditation in itself and you can do it anywhere and at any time. A five-minute tea break in the midst of a busy day can be so restorative, it might be followed by your best work on projects that need your attention, be it professional or personal. There are lots of brands of teas that will help address your needs, but personally I love Clearspring, Pukka, Teatox, Kuzmi (both loose and teabag varieties), Wunderworkshop Turmeric Tea (I am due to try their newly launched Chai Tea shortly and have a hunch it will become my new afternoon energy revivingr friend, based on my experience with the products created by Zoe, brand’s founder). If you like loose teas, I absolutely adore varieties produced by the Russian artisanal brand Botanical Garden. Lena and Nastya, BG founders, gather the herbs and plants, when they are at their most potent, or source them around Russia from ethical suppliers. I promise you the most special experience when drinking their teas, it is almost like poetry or fairytales being evoked from the bottom of your cup. Another tea brand worth mentioning is Elixir Living Tea. Elixir was set up by a group of tea specialists led by James Thirlwall, an experienced Chinese Medicine practitioner with a passion for sharing the tangible and lasting health benefits that drinking living tea can bring. Elixir was recommended to me by my acupuncturist last year and every time I make a cup of Elixir tea (Hidden Amber is my winter favourite ), it reminds me of the art form that is the Japanese tea-making ceremony. It also calms the mind, grounds the body and nurtures the body. Schedule some kind of heart-raising activity into your day. If you body is still struggling after the holidays, just go out and walk or run slowly int the fresh air. Or look up some free videos that might appeal to you, on Sweaty Betty, Tara Stiles or Louisa Drake for BareBiology. Any sport activity is good for you, if you actually do it. What works for one, doesn’t necessarily work for another, so find something that YOU actually are tempted to do and give it a go. Listen to what your body tells you and give it what it wants and needs. And show up – if you don’t look after yourself, no-one else will! I love this post Galina, it’s a total fit for me, thank you for sharing your experiences.